You may be thinking about investing in a self storage space to help you declutter your life, or simply because you have some valuable items that you don’t feel comfortable keeping around the home, yard or office. You may also be considering the best way to maximize your return on investment. While that is always wise financial thinking, it is equally wise to keep in mind the old saying, you get what you pay for. DIY storage units are available, but they are not always the best option. Below are four reasons to avoid cheap, DIY self storage. One of the biggest upsides to investing in professional self storage is that it comes with security. There will be people on-site, around-the-clock, making sure that only people who are authorized are allowed in the facility. There will be cameras, robust locks and actual human beings monitoring the premises and ensuring that your items are safe and sound. If the storage facility that you are using is entirely do-it-yourself, and for any reason, including negligence or poor decision making, some of your stuff is damaged or destroyed, there is going to be very little for you in the way of recourse to recoup your losses. A high quality storage facility offers insurance policies that will be useful in the event that something unforeseen happens on the part of the facility, or damage is caused by issues in adjacent storage lockers. 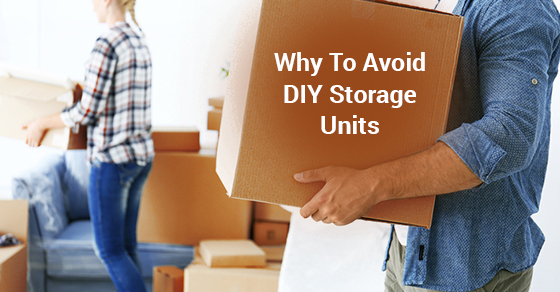 Most DIY storage facilities are not going to offer you the option of climate control. This means that anything valuable or delicate that you are storing that requires exact temperatures in order to maintain its functionality or its structural integrity is going to be immediately compromised when you put them into cheap self storage. If you are storing family heirlooms that you want to pass down to your children, important business documentation, or valuable electronics, you are going to want a storage unit that guarantees a constant climate. Cheap self storage can seem like the best option, especially if it is your first foray into self storage and you are worried about spending more money than your storage requirements necessitate. Self storage is not overly expensive and for a bit more money, you get much more peace of mind and a hedge against unforeseen damage to your property. You can ensure that your belongings are placed somewhere where they will be well supervised and looked after, with the bottom line being that you spend less time worrying about your valuables.